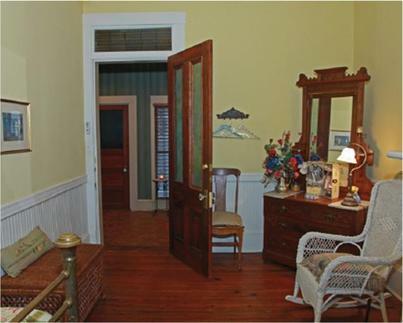 The Le Servant suite was the original servant's quarters for the Hodgson Mure house. What is now the Le Servant suite was actually detached from the house and previously positioned further back on the property. However, the servants quarters were later moved and attached to the main house by a shared porch which has now been converted into a sun room. The Le Servant suite includes the largest kitchen in the Mure House, which was the original kitchen for servicing the home. The suite also includes two large office spaces, a sun room suitable for a lobby for receiving visitors or a small conference room, a large closet and a parlor area. A full bath with a claw-foot tub/shower. In addition, a public storage-like shed is available for rent for the unit in either a 5'x20' or 10'x20' size. Also, as an office space rental, the tenants can pay an additional monthly fee to ensure access to a large conference room and use of the buildings receptionist for receiving guests. This suite is ideal for a small multiple-person office or a large apartment. As an apartment, the unit has a private entrance to the large parking area at the back of the house, as well as an entrance to the main portion of the house through a sun porch. As an Office, the employees can be directed through the back door into a private sun porch as a waiting area or, through the shared sun porch into a small sitting room or lobby. This suite can be used as a doctors office, lawyers office, residence, or any of a variety of other uses. Edward “Ned” Hodgson (1871-1967) was the son of Edward (Prince) Hodgson, for which Prince Avenue is named after. Ned and two of his brothers fought in the Civil War for the Confederacy. They served in Lumpkins Battery, a local militia. After the war Edward and the family went on to become leading citizens of Athens. The Hodgsons founded a number of successful businesses including stage coach, warehouses, chemicals, oil, cotton seed, and fertilizer. They also were instrumental in the development of the University of Georgia where several buildings are named after the family. One cousin by marriage (Nell Hodgson's husband Bob Woodruff) ran the Coca-Cola company. 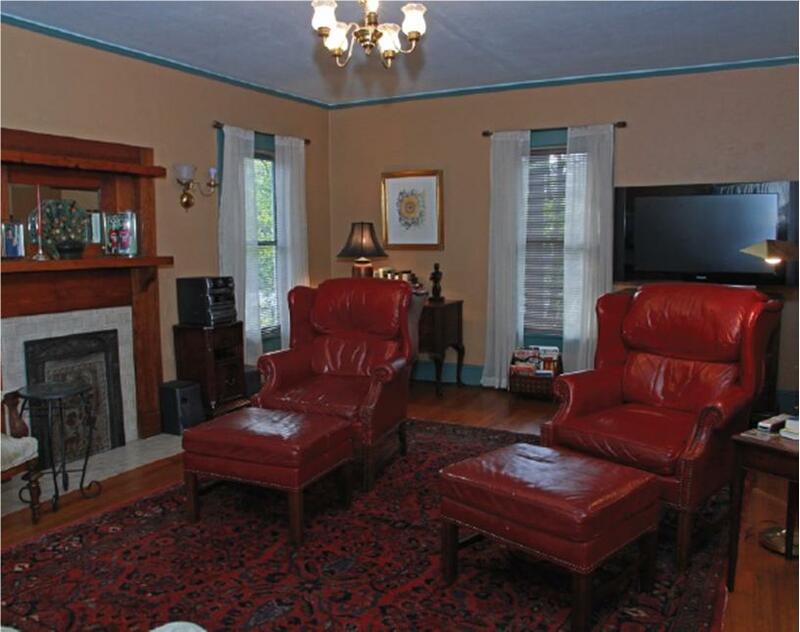 The Woodruff Suite is at the top of the stairs and to the right and is a single office suite with a fireplace and windows over-looking Prince Avenue. The wall is rounded which adds a bit of class to this office suite. The office suite does not include a private bath but, there is a full bath with shower down the hall from the office that is open for the use of the tenants. Also, as an office space rental, the tenants can pay an additional monthly fee to ensure access to a large room and use of the buildings receptionist for receiving guests. This suite is ideal for a single person office. Coupled with access to the conference room, the lobby for receiving visitors, the Woodruff Suite sets up a very professional environment that will certainly impress your clients, customers or guests. The Hodgsons seemed dto have a knack for building houses that attracted fraternities. Edward "Ned" Hodgson (1871-1967) married Mary McCullough, brother of Elizabeth Hodgson Mure, lived first on Harris Street and later at 1001 Prince Avenue (the street was named after his father, Edward [Prince] Hodgson). Later the family moved to 150 Milledge Avenue (which they later sold to the Alpha Delta Pi sorority). Sometime in the 1940's or later, the Elizabeth Hodgson Mure house was sold to the Fiji fraternity. According to ACHF Trustee Bill Bracewell, the house was the original location of the Phi Gamma Delta fraternity which moved into the house in 1968. At the time, the Kappa Deltas occupied the Neil Reed House (currently the Delta Tau Delta House) across the street and the Delta Chi fraternity was in a house located where Popeye's is now located. James Lankford, who has performed extensive remodeling as an owner of the Hodgson Mure house stated to me that the storage facility located at the back of the property is where the fraternities held their parties and it had been told to him that but for that storage facility, the house would never has survived this long. 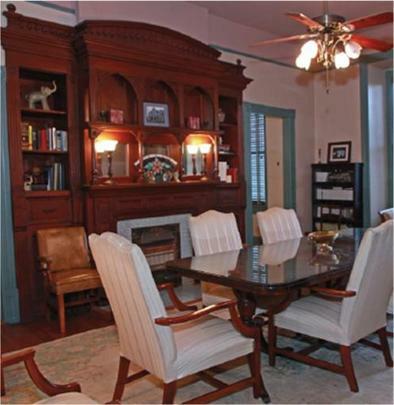 This Fraternity room is a large, single office suite with a wet bar and access to the full bath just outside the door. Fred and Susan Newberry purchased the Elizabeth Hodgson Mure House after it had been inhabited by two different fraternities. When they moved in, there was not a single room without at least two broken panes of glass, with bricks littered around the house to show the cause of the breakage. 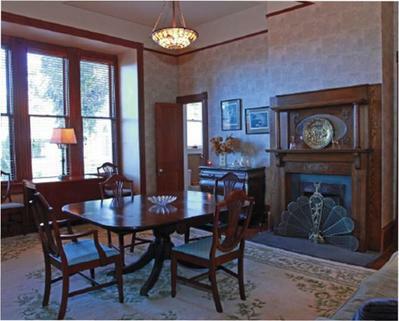 They picked the room with the fewest broken windows, moved in and began the long process of restoring the home. The first task, they cleaned all the pizza boxes out of the house, put $1000 into window repair and painted the outside a muted tan. Once the dust settled, Fred and Susan not only lived in the Hodgson Mure house, but Fred ran his paint company out of the house and Susan ran her interior design company. The Newberry Suite includes a large office space, a full kitchen and full bath. 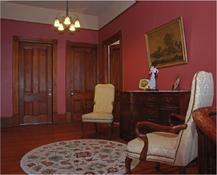 It is across the hallway from the conference room and tucked behind the elegant heart pine free standing staircase. Large windows look out the side of the house and a large closet is located at the front of the room. rent for the unit in either a 5'x20' or 10'x20' size. The Lankfords, James and Berthene (along with their sidekick Buddy) purchased the Elizabeth Hodgson Mure home in 1991 and arguably have done more for the restoration of the home than any of their predecessors. Apparently, after the Newberrys moved out of the house, the house was very neglected. When the Lankfords walked through the house, Mr. Lankford was certain that the quick tour was the extent of their time in the house. However, Mrs. Lankford had saw the potential and before they knew it, they were elbow deep in a restoration project. Throughout the home, it is clear that the Lankfords did more than remodel a historic house, they poured their hearts into the house to make it a home and a classic setting for their buisiness, Lankford Court Reporting. The most remarkable feat performed by the Lankfords is the restoration of the elegant staircase decorated with carved rosettes bearing the letter "M" for Mure. The entire staircase had been painted and they painstakingly removed every drop of paint and fully restored the beautiful wood finish. The Lankford room also includes the beautiful, built-in bookcase mantel which is also the back drop of a picture of the Newberrys (see the attached historic documents under the history tab). The Lankford room housed the operations for this still successful and on going business. The Lankford Suite includes a large office space that can house two to three employees comfortably. The office can be leased along with the conference room, full kitchen and full bath or, the unit can simply be leased by itself. In addition, a public storage-like shed is available for rent for the unit in either a 5'x20' or 10'x20' sizes. This suite is ideal for a small office of two to three people. Although not much history is available about the Mure family nor Robert Downie Mure, his wife Elizabeth Preston Hodgson was the daughter of Edward Prince Hodgson and sister of Edward Reginold Hodgson. Prince Avenue was named after her father and the Hodgson Mure house is located on what was certainly the Hodgson estate. 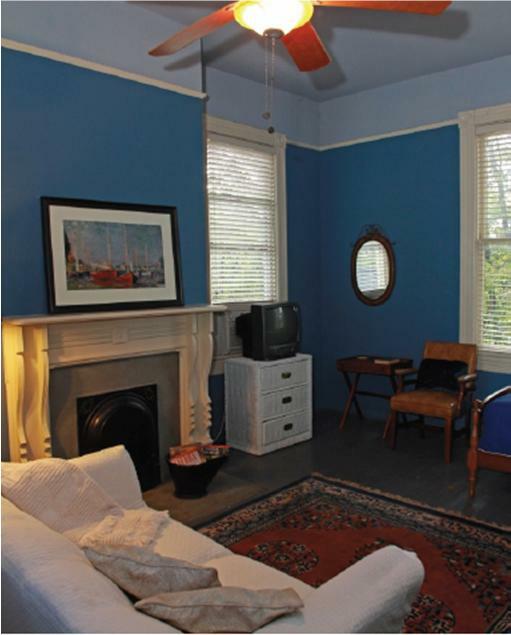 The Prince Hodgson Suite is a quaint office that includes a full kitchen with washer and dryer, and a full bath. 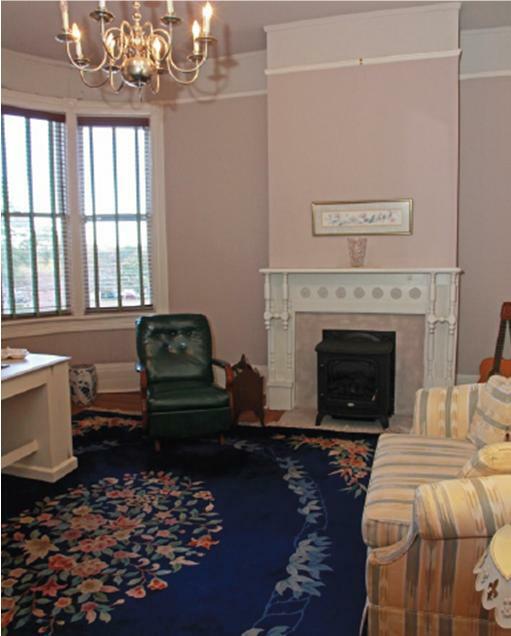 The suite opens to a sun porch with entrance to the parking lot or, access to the conference room and reception area. A public storage-like shed is available for rent for the unit in either a 5'x20' or 10'x20' size. This suite is ideal for a single or two person office. If necessary, negotiations can be made for allowing the tenants to set up a receptionist in the sunroom lobby for a moderate price. The Hodgson Mure house was purchased by the Durdens in the 1920's. And although we have absolutely no idea who in the world these people are, we did give them honorary mention by naming one of the suites after them. It is the least we could do since we lumped all the fraternities into one and gave them honorary mention. Actually, the Durden is arguably the most beautiful suite in the house with a full kitchen, beautiful heart pine floors and a full bath. The Durden is accessed at the top of the stairs and to the left through a door that is angled to the sitting area at the top of the stairs. This suite is ideal for a single or two person office. In addition, if a private receptionist is required, negotiations to secure the sitting area (pictured below) at the top of the stairs can be entertained at a moderate increase to the rent. Across from the upstairs landing, behind the two doors on the left, is where the Smith Suite will be located. This suite is presently uninhabitable and renovations will begin in April of 2013. Upon completion, the Smith Suite will include two large rooms, each with a closet, a full kitchen and a full bath. The rooms include plenty of windows and plenty of space for a small office of one with a private conference room or a two person office. This suite is ideal for a one or two person office. Video coming soon, showings are available and pre-leases will be received from interested parties. Early pre-leases may also have the opportunity to provide input into the remodelling.